Thomas Stothard was a painter and illustrator from Long Acre, well-known at his time for his history painting. He joined his profession at an early age, first training as a silk pattern designer; he was admitted in 1777 to the Royal Academy Schools. Book illustration was perhaps his most productive employment, though he never lost touch with the ‘higher arts’. His early art was influenced by his initial training in the silk pattern trade, and was therefore rather decorated and ornate. 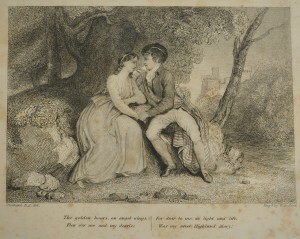 Besides the Scottish connection for George Thomson’s commission to illustrate his Select Collection of Original Scottish Airs, Stothard visited Scotland in the summer of 1809 to take inspiration for illustrations for Cadell and Davies’s 1814 edition of Robert Burns’s Poetical Works, as well as Joseph Ritson’s 1821 Caledonian Muse and other works. 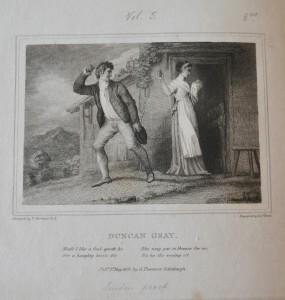 He was one of the most prolific artists for Thomson’s publication. He worked on at least ten of the Burns-related works in Thomson’s collections. 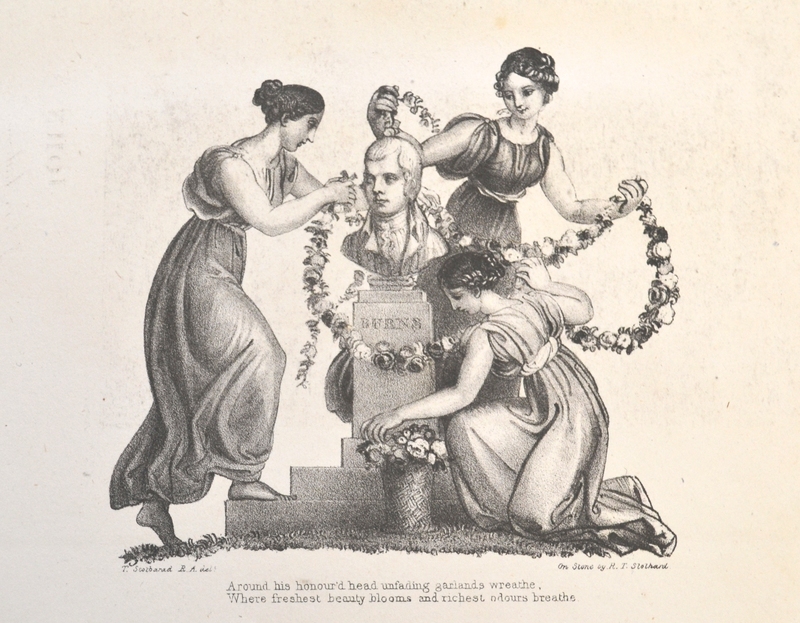 Stothard also designed a version of the illustration to the song ‘John Anderson my Jo’, sculpted by Paton Thomson. 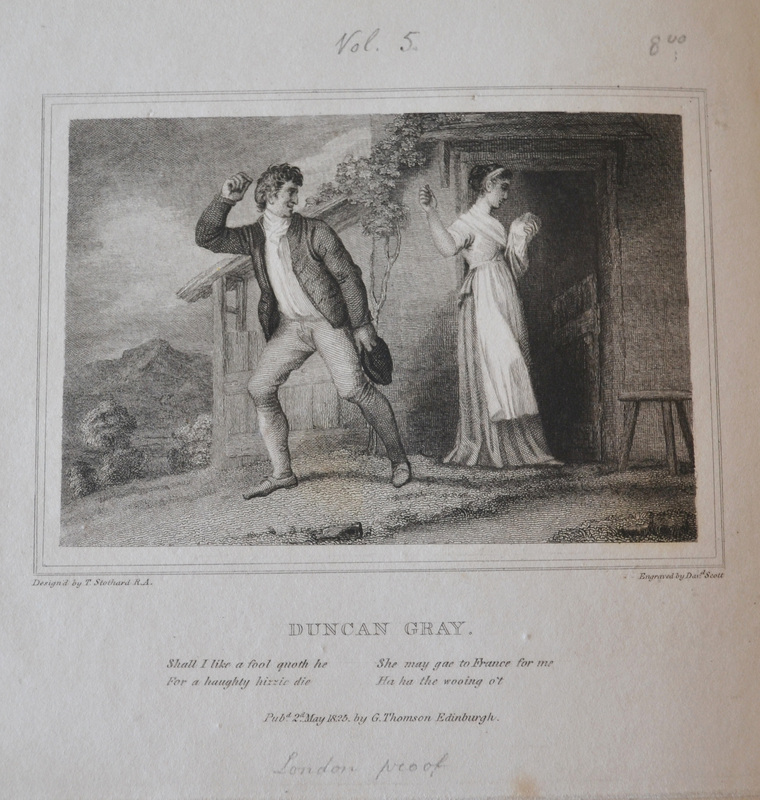 Stothard’s was not the version which made it to the published work, as David Allan‘s version was preferred. 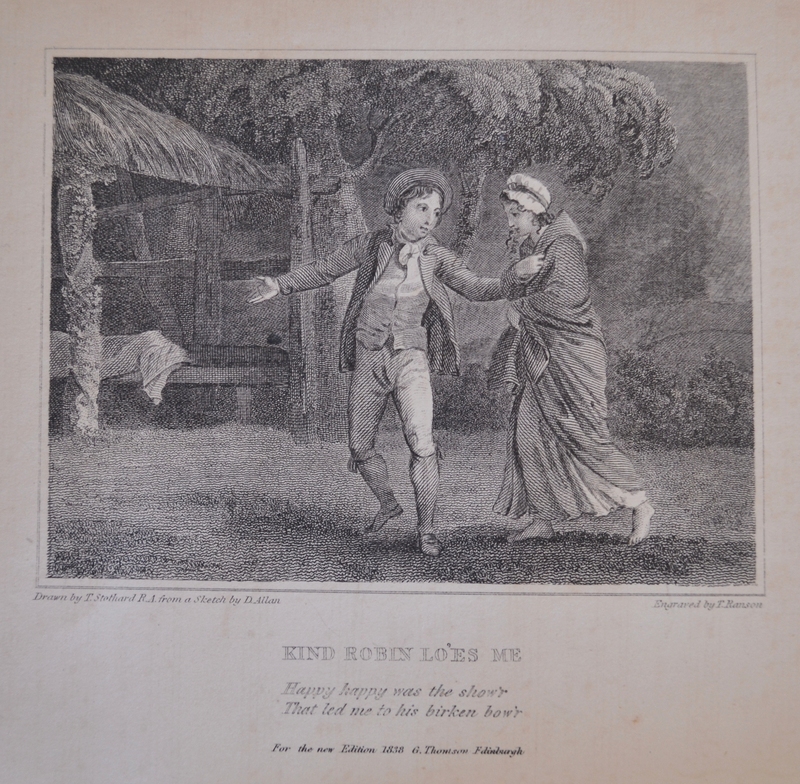 We have an unpublished proof though, which shows Stothard’s take on one of Burns’ most famous songs. It is very similar to Allan’s: it is an intimate domestic scene with an elderly couple sitting together, while a cauldron boils on the fire and a cat sits next to old John Anderson. 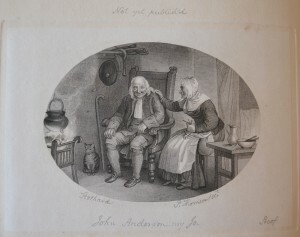 His wife’s expression is tender, as she leans towards John Anderson with a smile. 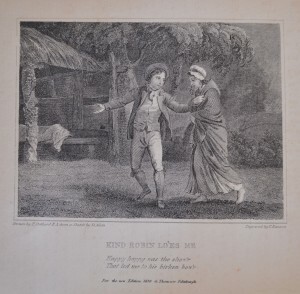 And in fact the maid, wrapped in a shawl, is depicted as she is invited to Robin’s shelter. 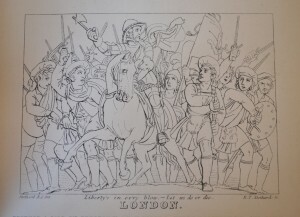 ‘Liberty’s in evry blow’ deals with a very different subject: it captures the feelings of Burns’s famous song ‘Scots wha hae’. Both the folio edition and the octavo have a version of this illustration by Stothard. 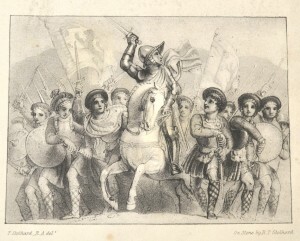 The folio image is richer in detail, and shows a young Robert the Bruce leading his army – some characters look at him with adoration as he towers above them on his horse, brandishing a sword. 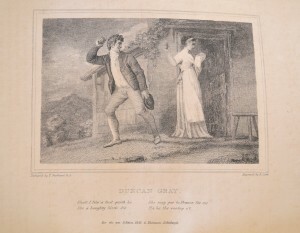 The octavo version is almost a sketch, with no chiaroscuro effect to render the three-dimensionality of the work; but it is not less powerful in its appeal on the viewer. 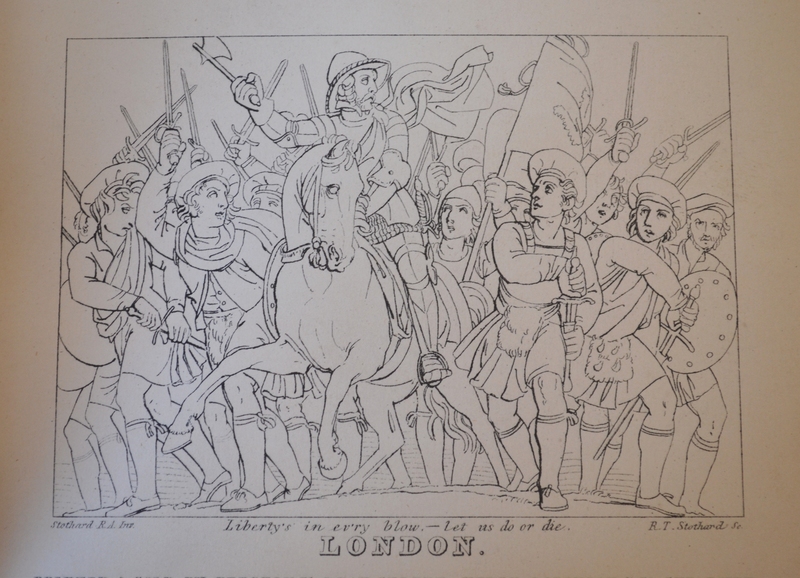 The background details (the flags, the swords) are given equal prominence to the characters in the foreground. Robert the Bruce is portrayed as older, with an imposing moustache and carrying a small axe rather than a sword. Stothard designed two versions of ‘Now see where Caledonia’s Genius mourns’. One was sculpted by Maxim Gauci, and the other by John Thomson (though this particular task eventually went to Paton Thomson). Both show a lady mourning over an urn depicting the head of Robert Burns: the ‘Scottish Muse’ grieves at the death of “Caledonia’s Genius”. 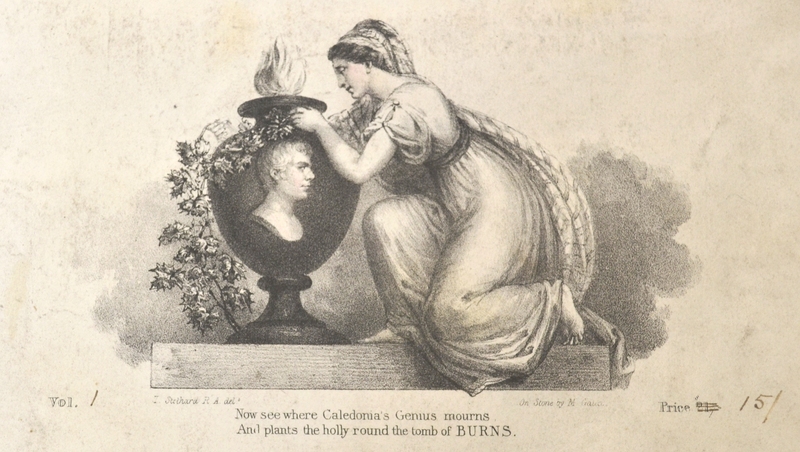 Gauci’s version adds a Scottish note to the scene by adorning the lady with a tartan shawl. 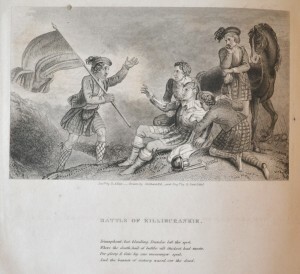 The classical imagery aims at elevating the status of Scottish poetry to that of the ‘classics’. These two images are not meant to illustrate a passage from a song, but they are a tribute and dedication to Robert Burns, and his contribution to Scottish poetry. Although Stothard continued to work until the end of his life, a series of personal tragedies – the sudden loss of his wife, three of his sons, and a close friend – led him to a withdrawn, secluded existence. 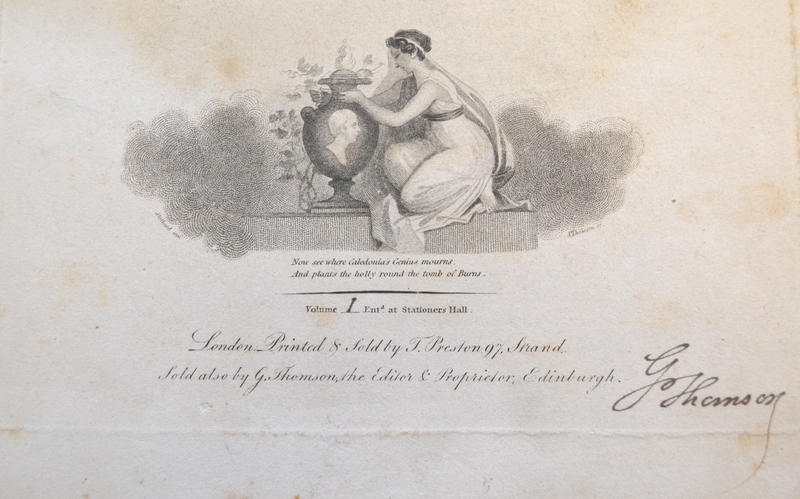 In late 1833 he was injured after being hit by a carriage, and he died in London the next year. He left a conspicuous wealth to his remaining offspring, which shows his success and industriousness throughout his life.